Motherwell crashed out the Europa League with a late Extra time sickener in Stjarnan. The Steelmen, who led 2-0 at Fir Park before being pegged back in injury-time, again got an early goal when Steven Hammell scored a rare header but Keith Lasley gave away his third penalty of the tie and Olafur Finsen levelled in the 37th minute. Lionel Ainsworth volleyed Motherwell ahead midway through the second half, but Rolf Toft took the game into extra-time with an impressive strike five minutes from time and Atli Johansson scored a spectacular winner in the second period of extra-time to secure a 5-4 aggregate win. Motherwell forced a succession of early corners on the artificial surface and the pressure paid off in the 12th minute when Hammell powered a header into the top corner from Ainsworth’s delivery. Lasley came close from another corner when he fired just wide and Motherwell were looking comfortable but Hammell had to throw himself in front of Toft’s shot to maintain the away lead. And Lasley was soon on the end of a controversial decision by Greek referee Antonis Giachos, who ruled he had brought down Johansson in the box, although the award might easily have gone in Motherwell’s favour after the Stjarnan player brushed into the midfielder’s body and fell over. Finsen, just as he did twice at Fir Park, converted the penalty. Lasley was determined to atone and almost did so on the stroke of half-time with a volley that was well-stopped by Ingvar Jonsson. Motherwell almost fell behind early in the second half but Dan Twardzik came off his line quickly to foil Toft. But Stuart McCall’s side came roaring back and Lasley came close again following another corner when his shot was deflected over. Craig Reid’s cross was then deflected on to the post and Ainsworth’s delivery was just turned wide as the hosts continued to live dangerously. Stjarnan broke and Pablo Punyed shot wide just before Ainsworth put Motherwell ahead for the third time in the tie. Josh Law, who scored twice in the first 19 minutes at Fir Park, sent in a delightful ball and Ainsworth volleyed home from close range. Motherwell almost squandered their lead again when Hordur Arnason got in behind Reid but he made a hash of his finish. McCall, knowing his men would at least get to extra-time unless Stjarnan scored twice, brought on Fraser Kerr and Zaine Francis-Angol for Ainsworth and Law in the 74th minute for fresh legs and more defensive strength. But there was another twist when Toft levelled with five minutes left as he shot into the top corner from the edge of the box. Motherwell lost Stuart Carswell to injury early in extra-time as Jack Leitch came on and Jonsson made a great double stop from Lasley and Sutton, but the hosts then missed two good chances. And Stjarnan, who are unbeaten in the league after 12 matches, won it with seven minutes left when Johansson fired a long-range volley in off the bar to set up a tie with Lech Poznan. 26mins: Corner to ‘Well, Sutton heads just past but ref has ruled he had fouled Praest. 18mins: Sutton wins a corner… Jonsson punches clear and gets injured in the process. 13mins: Lasley booked for a foul on Arnasson in the Stjarnan box…. 8mins: Lasley then Sutton denied superbly by Jonsson! First half of extra time underway…. Picked the ball up on the edge of the box, and lashed it into the top corner. 85mins: GOAL! Toft pulls Stjarnan level! 70mins: Toft leaves a boot in on Twardzik and his booked. 69mins: Bit of a let off there as Arnason got in behind Reid. From a narrow angle, he sliced his shot well wide. 66mins: AINSWORTH volleys home from close range from Law’s lovely ball in!!! 64mins: Punyed races on goal, Twardzik does enough to put him off and he drags his shot just wide. 58mins: Reid’s low cross is deflected and hits the post! 55mins: Sutton forces a corner for ‘Well…Lasley’s shot is almost defelcted over Jonsson! 52mins: Great save from Twardzik, sliding out to the feet of Toft to deny a certain goal! 45mins: What as save from Jonsson to deny Lasley’s right footed volley! On initial viewing looked like Toft was behind Lasley and kicked his leg and fell over. WIll need to see again. 43mins: Carswell booked for dissent. 37mins: GOAL – Finsen converts. 36mins: Stjarnan have a penalty!! 29mins: Stjarnan get a corner when it was clearly a foul on Hammell. Comes to no harm anyway. 25mins: Ainsworth cuts in on his left foot but his shot from distance lack power. Easy save. 24mins: McManus booked for a rash tackle on Punyed. 22mins: Lasley drills a shot just wide of the post from a corner routine. Unlucky! 13mins: Yet another corner, falls to Hammell again but he opts to clip it back into the box, ‘keeper gathers. 10mins: Reid forces another corner…..GGOOOAAALLLLL!!! 8mins: Decent ball into the box by Ainsworth but Jonsson is there to gather. 1min: Game is underway here in Iceland! ‘Well boss Stuart McCall was optimistic as his side prepare to face Stjarnan in the Europa League tomorrow. The Steelmen are in Garðabær, just outside Reykjavik, and trained in the Samsung völlurinn 24 hours ahead of Thursday’s second leg tie. The score is poised evenly at 2-2 and McCall hopes with another game under their belts, his team can really take the game to Rúnar Páll Sigmundsson’s side. “It was our first competitive game and hopefully that’s got rid of a bit of rustiness, and we can go there and get the result we need,” he said. “We have a squad of players who are capable of getting a result and hopefully we are still in Europe come Friday morning. Stjarnan have today confirmed ticket information for next Thursday’s Europa League 2nd Qualifying Round, 2nd Leg match. Tickets will be available direct from the Stjarnan at the Samsung völlurinn on both Wednesday (from 2pm) and Thursday, but are restricted to 85 for general sale served on a first-come-first-served basis. General Manager Alan Burrows said: “We advised Stjarnan eight days ago that we expected approximately 300 / 400 Motherwell fans to make the trip to Iceland and asked for as many tickets as possible. “Frustratingly, the Samsung völlurinn holds just 1000 people meaning our allocation is small with UEFA rules stipulating a minimum of 5% (fifty tickets). “Stjarnan advised us that they hoped to accommodate as many Motherwell fans as possible but we are being limited to one block within the stadium. The Icelanders have confirmed ‘Well fans will be made most welcome at the All-in SportsBar near the ground before and after the match. The game will also be shown live on Icelandic television – Stöð 2 sport. 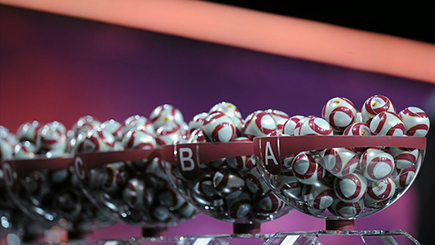 The reward for the winners of next Thursday’s match in Iceland is a Third Round tie against JK Nõmme Kalju or Lech Poznań. Motherwell and Stjarnan played out an exciting, if ultimately frustrating, 2-2 draw at Fir Park last night. It’s all to play for in six days time, including a potential match against the Polish giants although the Estonian side are 1-0 up from the first leg. Highlights from Fir Park as the Steelmen were pegged back back to a 2-2 draw despite a commanding first-half lead. Action pictures from the 2-2 draw with Stjarnan at Fir Park in the UEFA Europa League. ‘Well boss Stuart McCall was upbeat despite watching his side being pegged back to a 2-2 draw in the 92nd minute. The Steelmen started brightly and debutant Josh Law hit a double before a penalty allowed Stjarnan in after Lasley was adjudged to have handled in the area. Both teams had chances to score again but it was another penalty, two minutes form time, pulled the Icelanders level. Olafur Karl Finsen, who scored with the first spot kick, kept his cool to convert again leaving the tie wide open ahead of the second leg in Iceland next Thursday. “If we’re honest, it could’ve been six all. Being 2-0 up, it’s then a disappointing scoreline but we’re by no means out of the game,” said McCall. “But listen, it’s our first competitive game and I think you could tell that we’re rusty in a lot of areas. “Someone shouted from behind (the dugout) that we were ‘playing nothing’ but they were good players and I knew they’d create chances against us.